You got me a bit anxious for a moment, Blake, as I took a quick glance at this post! I wouldn't want to be deprived of your entertaining and insightful near-daily read. Cheers! This already sounds Boring. Slow news day? Why not the Gray Area? So are there any changes aside from the removal of the word 'market' in the title? And hopefully all wines will be reviewed using the new and innovative "Gray Scale". Well I changed the url, so that's something. The Gray Area? It's a great idea, but there are a couple of sites called that already. I originally considered Gray Matter as well but that has also been done. I had been thinking about the change for a while because when people who like my blog introduce me to people who have never heard of me (this actually happens a lot at wine events), they invariably say, "The Gray Report." Nobody ever says "Market." The ex-newspaperman in me saw a capitalized word unnecessarily taking up space. Plus, I originally called it "The Gray Market Report" as a pun on the gray market for premium wines, but I never really report on that so it's kind of misleading. Jo6pac: Yep, slow news day. But what the heck, if my former employer changed its name to The Francisco Chronicle, they'd issue at least a blog post. So what the heck. Blake, you can change the name of your wine blog but I hope so much to read your post again and again. 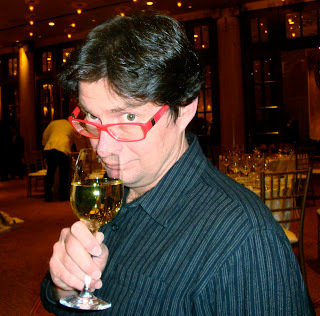 If you're retiring, may I have those cool red glasses? PCP: If your eyes were bad enough to wear my glasses, you wouldn't be able to tell your finocchiona from your soppressata. Disaster! Like the new name. Nothing wrong with "Going Gray"
Blake, I think that I want to be you when I grow up.